PLOT: In 1985, Kung Fury, the toughest martial artist cop in Miami, goes back in time to kill the worst criminal of all time – kung fuhrer Hitler. Kung Fury is a 30 minute martial arts comedy written, directed and starring David Sandberg. But those words pay no justice to the visual extravaganza that awaits. The film pays homage to the excess of the 1980s and in particular the cop action movies of the time. Funded through Kickstarter, the film unfortunately fell short of its stretch goal of $1m that would have allowed it to be extended into a full feature film. Though it did smash its initial funding target, raising more than three times the goal with over $630,000. The year is 1985 and a Miami Police Department detective and his partner Dragon are chasing down a mysterious kung-fu master known as the Red Ninja. Dragon is killed and before the cop can react he is struck by lightning, and bitten by a cobra, giving him extraordinary kung fu powers that enable him to defeat his enemy. From that moment he is know as Kung Fury, who must travel back in time to defeat the Kung Führer, Adolf Hitler. 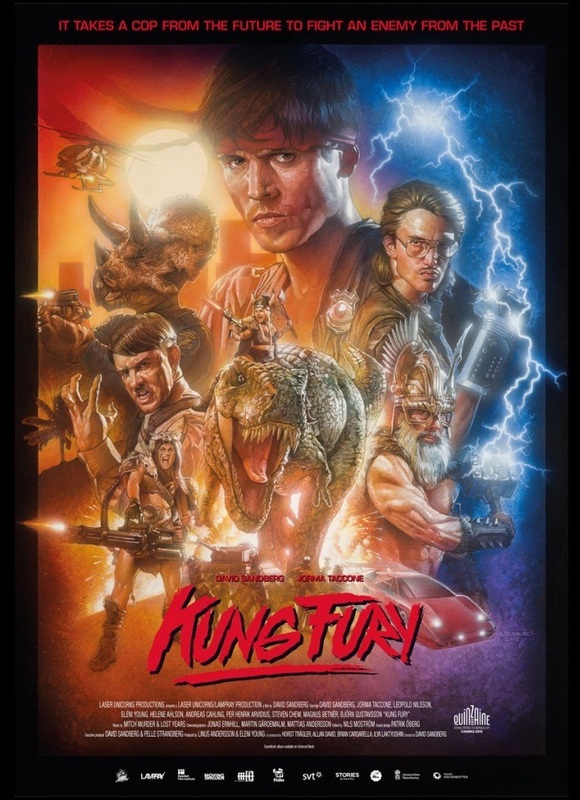 Kung Fury is the most over the top movie you will ever see with visuals dripping in neon, an 80s style electronic soundtrack, slick special effects made to look cheap, cheesy one-liners, dinosaurs, mullets, Nazis, beautiful Barbarian babes, a Nintendo Powerglove, a gun-totting arcade machine and even David Hasselhoff! The script is deliberately painful, the acting is deliberately hammed up and the action is deliberately awesome. If you want to press pause on the real world and take a half hour break from rational thought then give Kung Fury a go. Your life will never be the same again. As promised in Sandberg’s Kickstarter pitch, once complete the film was made available for free on Youtube and you can check out the full film below. You can also find the video to The Hoff’s track ‘True Survivor’, featuring reworked scenes from the film with Hoff replacing other characters. Completing the 80s themed multimedia trinity is a free video game, Kung Fury: Street Rage, based on classic side scrolling beat em ups like Streets of Rage and Double Dragon. Hopefully this proof of concept will enable Sandberg to realise his dream of a making full 80s action movie some time soon. But in the meantime I will just keep re-watching Kung Fury, the most 80s film you will ever see. If it had been released in the 80s the VHS tape would have worn out in no time! A half hour assault on the senses. Every joke, explosion and cliche from every 80s cop action film, remixed into a thing of beauty.